This cabinet exemplifies how the commissioning process works. 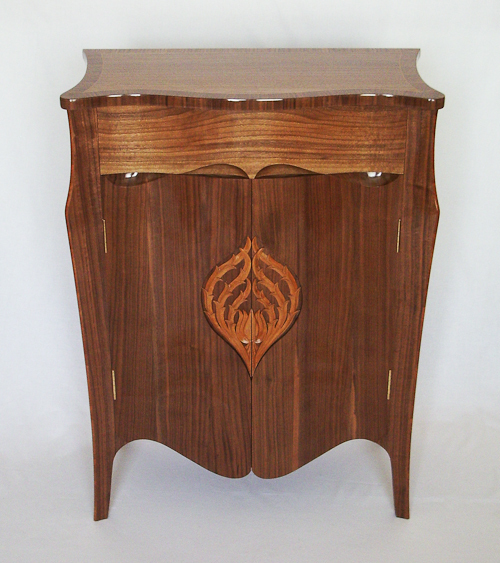 Although the client wanted a cabinet characteristic of my design style she had certain requirements of her own. After the first visit we ascertained what these were, namely size and function, together with a design which would sit comfortably with the existing decor. She also expressed a preference for a dark timber. On the second visit we discussed a number of my designs, in the form of colour drawings. We also discussed the timber samples I had brought, and I provided a quotation. Having given the go-ahead the client paid one third of the total at this stage - the remaining two thirds payable upon delivery. The resulting cabinet was constructed principally in American Black Walnut, whilst the carved onion motif in Cherry Wood referenced the Arts and Crafts Onion Pattern wallpaper in orange. Its dimensions reflected the narrowness of the hallway for which it was destined, as did the avoidance of protruding door and drawer pulls.